This bike performs as good as it looks! Dyno tuned by the Classy Chassis with Vance & Hines Hi-Output Exhaust! 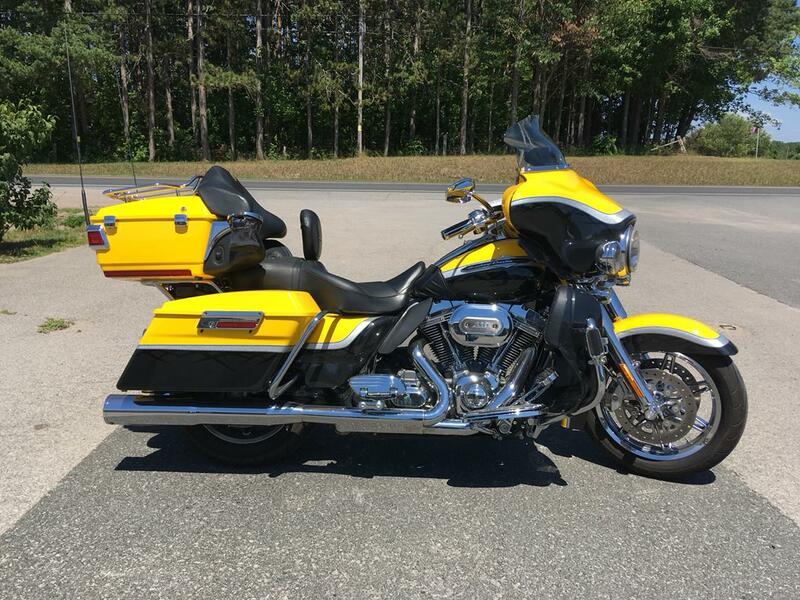 Top of the line Grand American Touring as only Harley-Davidson® does it. From power to premium features—when you want it all, this bike can bring it. Exclusive CVO™ Enhancements: All the quality. All the legacy of the Harley-Davidson® name. Plus custom touches and performance that distinguish you from every other bike on the road. Sure there's a little vanity. Premium custom paint. Big, tricked-out wheels. The perfect storm of engineering and style you'll only find on a custom machine. And you'll spoil yourself with the accessories—from comfort to electronics to chrome. 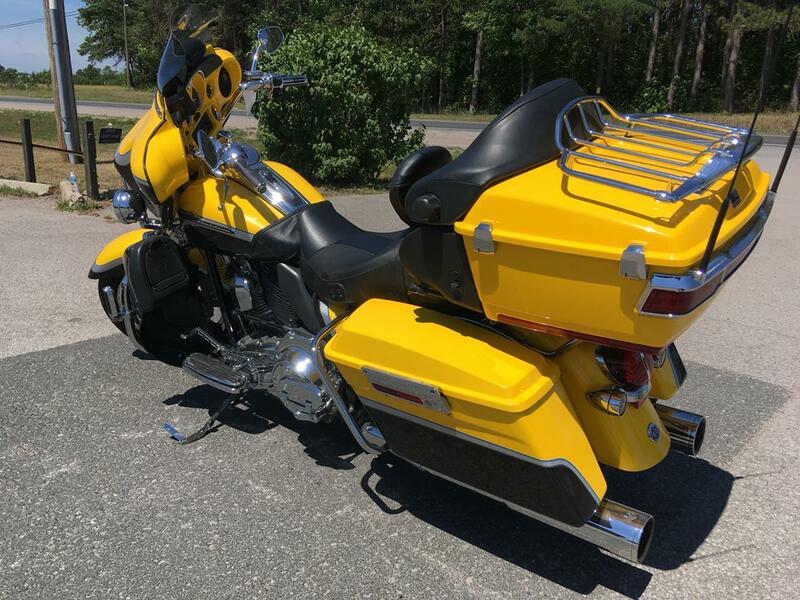 But the real signature of a Harley-Davidson® Custom Vehicle Operations™ motorcycle is the explosive power and sleek detailing of the huge Screamin' Eagle® engine. It's custom-built, not just for anyone, but for true connoisseurs of the road. GTX® Saddlebags and Tour-Pak®: These injection-molded hard bags have room for 2.26 cu. ft. volume of long-haul luxuries and a perfect surface for showing off some premium paint. 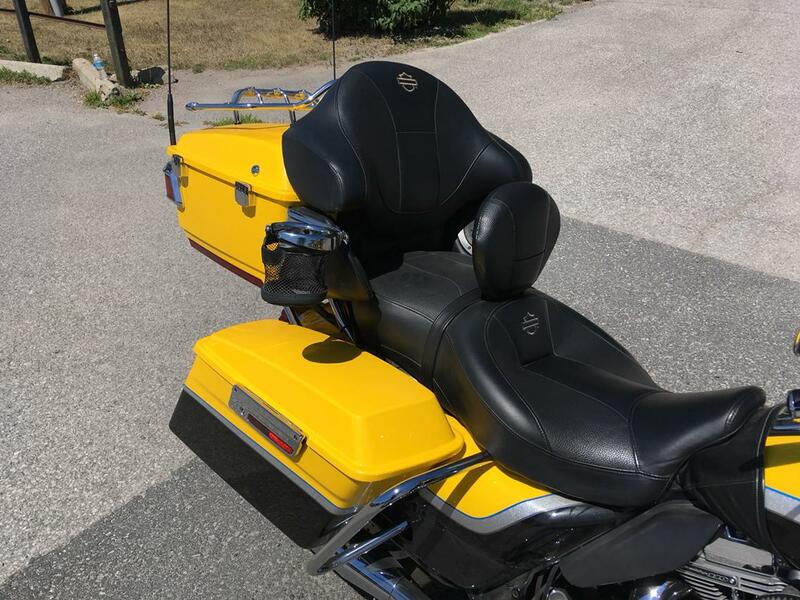 Even better, these saddlebags open from the top, so your gear won't end up spilled all over the highway. They keep your fancy unmentionables dry, and the chrome latches won't corrode in bad weather. And when you're off the road, one common key starts the bike and gives you access to your saddlebags, keeping your pockets as uncluttered as your bike's refined design. The premium Tour-Pak® adds to the luxury look and gives you even more space to pack stuff for the road. And we add another layer to the mix with exclusive Custom Vehicle Operations™ saddlebag and Tour-Pak® carry-out liners. Dual-direction zippers for more access. Side pockets for your quick-reach items like cell phones, keys and wallet. Rubber bottoms that keep the insides dry and clean, and d-rings let you clip on attachments and shoulder straps for easy transport. Chrome Wraparound LED Brake/Tail Lamp: The back end of the CVO Ultra Classic Electra Glide model demonstrates once again the premium style and innovative engineering you'll find with the Custom Vehicle Operations at Harley-Davidson®. The taillight features an integrated chrome wraparound brake light for a clean look. And with its wraparound coverage, you get additional style, increased visual footprint at night and long-lasting LEDs that just keep burning on. Chrome Dual Exhaust: The premium custom look goes the distance on the CVO™ Ultra Classic® Electra Glide® model with the chrome dual exhaust. 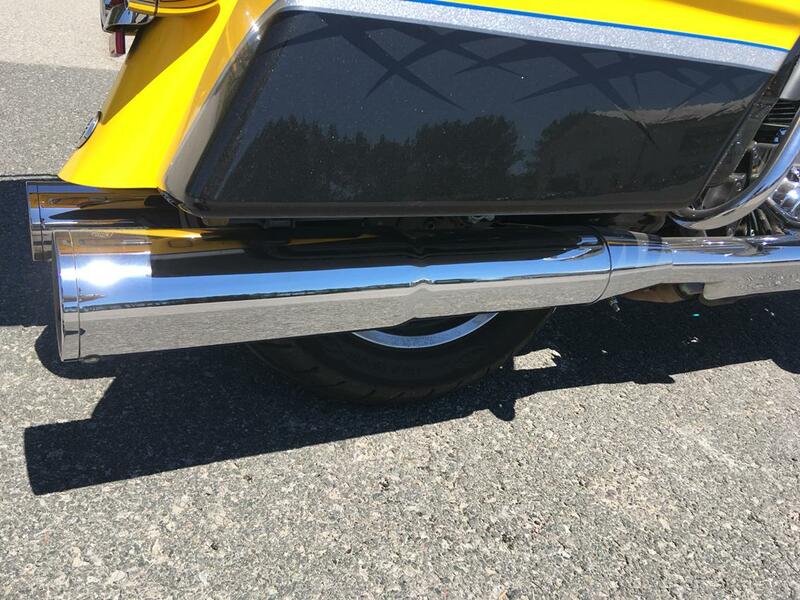 Featuring 4-inch touring mufflers, chrome billet end caps with black spears and chrome touring exhaust shields. Relish in the rumble and performance of these high-end pipes. Chrome Chisel Wheels: Aggressive yet balanced, every element of the CVO Ultra Classic Electra Glide model is painstakingly designed to deliver the most luxurious riding experience—and that includes the chrome Chisel wheels with matching open rotors. With a 17-inch front wheel and a 16-inch in back, this Ultra boasts smooth, nimble handling no matter where your journey takes you. Diamond-Cut Gauges: Just like the most precious stone on Earth, the diamond-cut gauges on the CVO™ Ultra Classic® Electra Glide® model speak to the custom, high-end look of the bike. Precise, crisp in every line, reading their displays reminds you every time that you are rolling on an exclusive motorcycle made by a legendary American company. 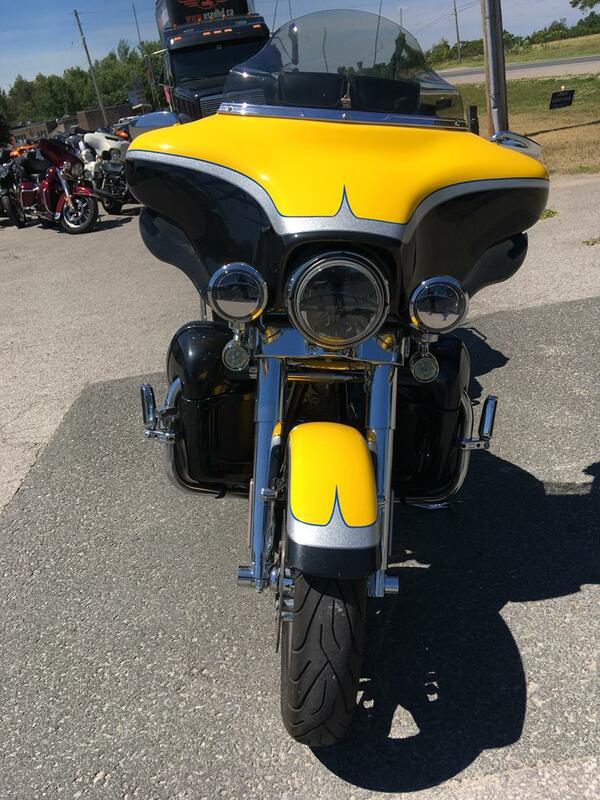 High-Impact Paint and Graphics: Individually crafted and hand finished, high-impact paint and graphics come standard on all Harley-Davidson® Custom Vehicle Operations™ motorcycles. The CVO Ultra Classic Electra Glide's exclusive color schemes are adorned with concentrated glass and mirrors for a light-catching candy appearance, while the Big City Lights graphic makes for a dramatic highlight. Skimping? The word's simply not in our vocabulary. Hand Finished Fuel Tank: Harley-Davidson® fuel tanks are finished by hand—that's what makes them stand out from the competition. Their seamless design and unmatched style are unique among all motorcycles on the road. The tanks are one of the first and last things people notice when they lay their eyes on a Harley-Davidson® motorcycle—so we make it worth their time. 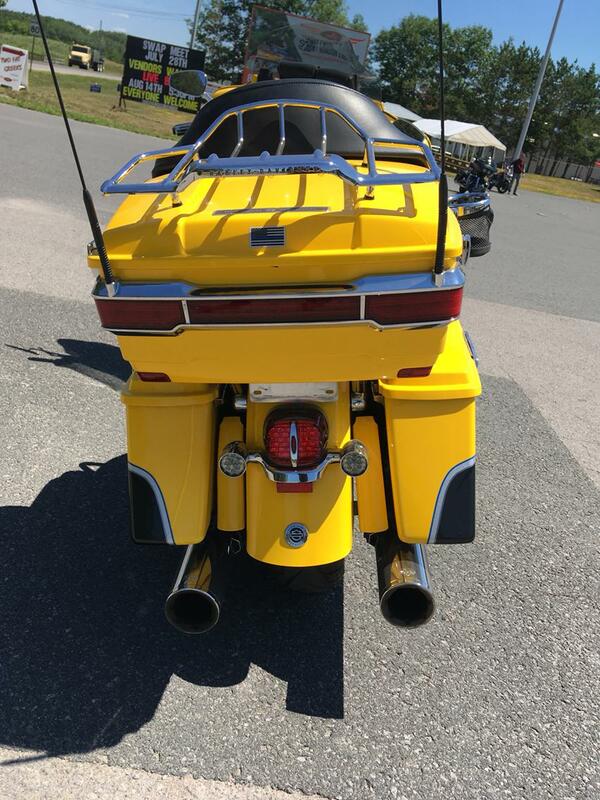 And a classically styled, bold six-gallon fuel tank doesn't just give you a bigger canvas for premium or custom paint; it holds six gallons of go so you can eat up a lot more road between pit stops. 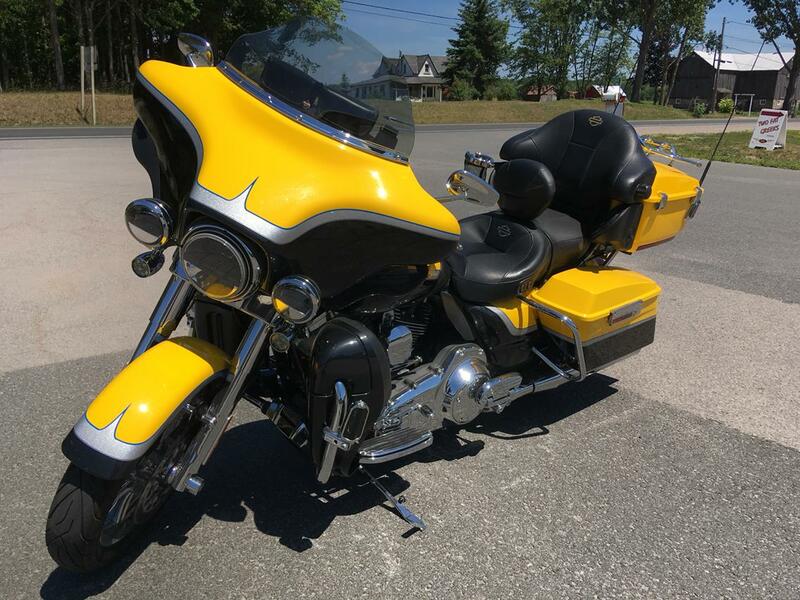 Screamin' Eagle® Twin Cam 110™ Engine Heritage: The knowledge of what makes an engine truly move a rider runs deep at The Motor Company, and it was put to good use when we created the Screamin' Eagle® Twin Cam 110™ engine. We sweated bullets perfecting every cubic inch, pushing design and technology forward. And we did it all without compromising one bit of Harley-Davidson's unique styling. Evolved, yet carrying on the legacy of the Flathead, Knucklehead, Panhead, Shovelhead, Evolution® and Twin Cam 88® engines that came before. The performance and durability are a direct result of the untold miles logged on the V-Twin since 1909, and the proud heritage that comes from a century's worth of commitment to life on two wheels. Pure Harley-Davidson Styling: Feast your eyes on the Twin Cam 110™ engine and there's no mistaking its roots. This is authentic Harley-Davidson® style through and through with an attention to detail you won't find from any other motorcycle company. Exclusive to the Custom Vehicle Operations™ line, the granite colored powertrain with chrome covers and 110 badges is unapologetically distinguished. It's a jewel machined out of metal. Pure. Dripping with power. From the classic edge of the cooling fins to the clean lines of cases and covers—the Twin Cam 110™ engine makes an ironclad statement to holding on to what's right and staying true to what satisfies the rider. Six-Speed Cruise Drive®: You want a ride that rumbles—not begs for mercy—when you lean on it a little. The Six-Speed Cruise Drive® transmission provides smooth, quiet shifting and reduces engine speed on the highway, so you get a better match between engine turnover and road speed. And the Isolated Drive System makes acceleration flow in a smooth, steady stream from your wrist right down to the pavement. It's a rare ride when a bike responds like this when you're opening up the road ahead. Hydraulic Clutch: Performance gets the custom treatment on Custom Vehicle Operations™ motorcycles. The addition of a high-performance clutch with hydraulic actuation helps make sure you're getting a smooth, confident feel with just the right amount of effort and a hands-off reliability that's only fitting. And you'll love the confidence and control it lends when harnessing those 110 cubic inches of Screamin' Eagle® power. Screamin' Eagle® Twin Cam 110™ Engine Innovation: Fire up the Twin Cam 110™ engine and feel the low-end torque unleashed. The colossal 110 cubic inches provide seemingly endless torque with adrenaline-pumping pull through all six gears. 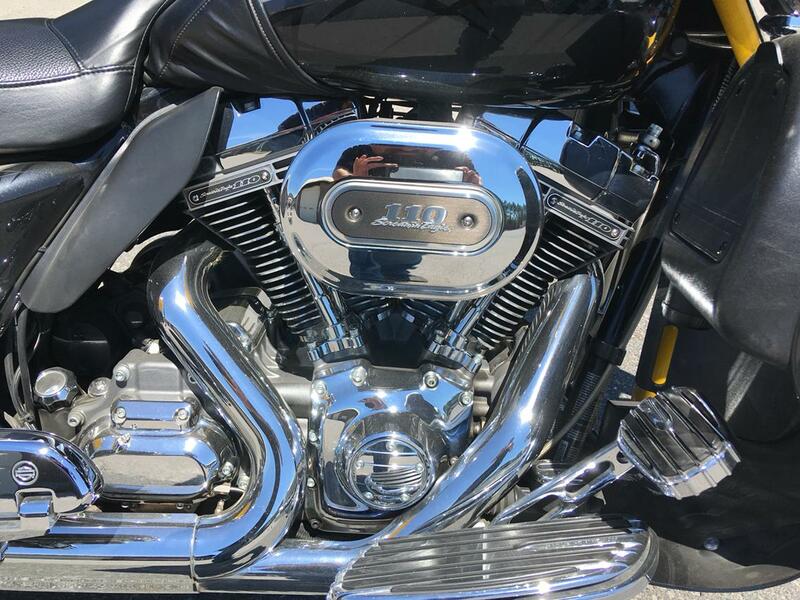 Boasting the largest-displacement V-Twin engine by Harley-Davidson, the Twin Cam 110™ engine produces 115 ft. lbs. of torque at 4000 rpm. Six speeds. A strong driveline and strong internal parts. And a low cruising rpm that couldn't feel better. 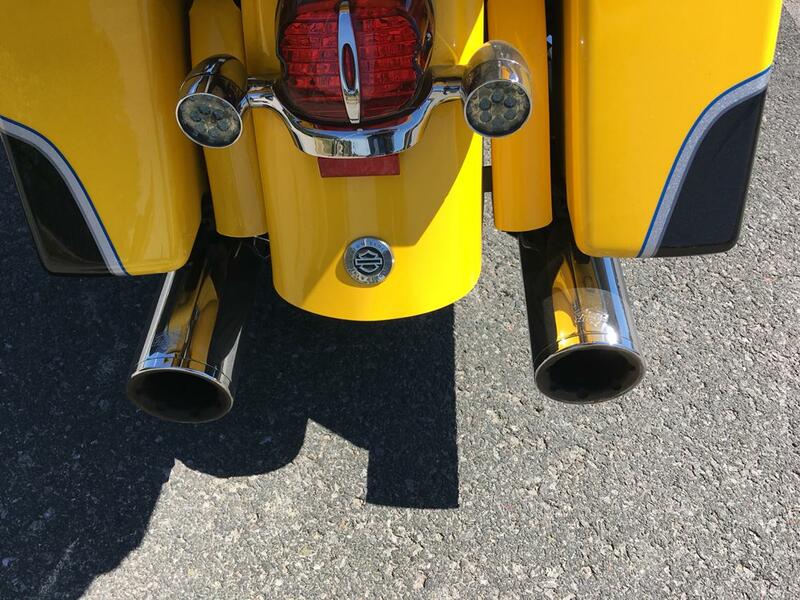 "Ventilator" Intake with Screamin' Eagle® 110 Insert: Everything about the Screamin' Eagle® Twin Cam 110™ Engine is a testament to the premium styling and performance you get with a limited Harley-Davidson® motorcycle. Right smack between the engine jugs rests the high-flow "ventilator" intake with high-flow filter element, back plate, diamond-cut Screamin' Eagle badge and protective rain sock. Your bike will breathe easy while the increased air flow boosts the raw power. Unique and exclusive. That is what Custom Vehicle Operations™ is all about. Road Tech Zu-mo® 660 Navigation System: You may know where you're headed, but this little dandy helps you get more out of every mile. The quick-mount cradle makes it easy to mount and detach and it plays nice with the bike's tight lines. 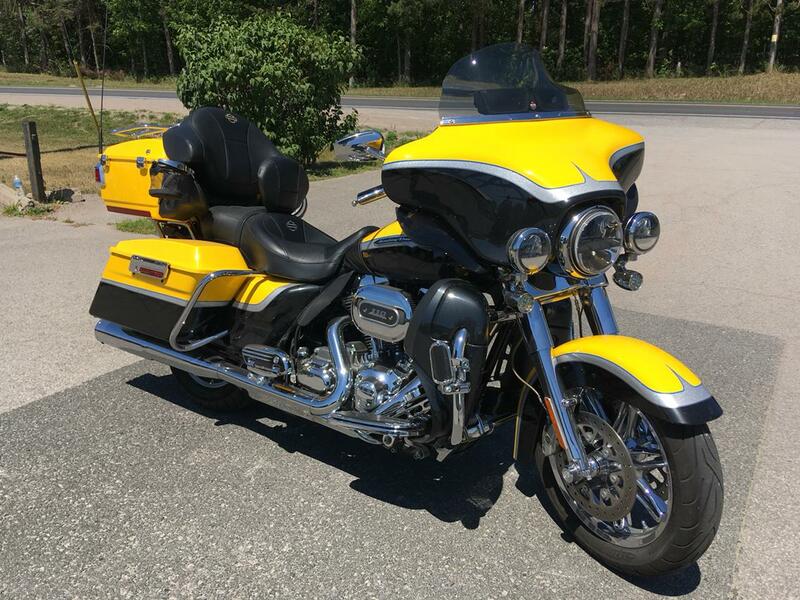 Designed by bikers for bikers, it's preloaded with City Navigator® NT street maps and markers for H-D® dealers, motels, restaurants, fuel, ATMs and anything else you might need while out on the road. Anti-Lock Brakes: When it comes to the CVO™ Ultra Classic® Electra Glide® model with ABS, "stopping power" has a double meaning. The components of our ABS are tastefully hidden within the wheel hub, so you'll still turn heads with a clean, streamlined design. More importantly, though, you get certainty in the saddle knowing your bike's going to behave when you need it. High Output Accessory Connector: Harley-Davidson® touring means maximum comfort in all conditions and the capacity to add whatever enhances and personalizes your ride. The high output charging system provides an electrical capacity robust enough for your add-ons: heated vests, lights to showcase the engine, you name it. So if you're hell-bent on two-wheeling it, we make sure you've got the juice to do it your way. Tour-Pak®-Mounted 12V Power Supply: Whether you need a quick charge for your cell phone or dinner from a hotplate on a lonely stretch of road, knowing you've got 15 amps of power to get through the day or night goes a long way. And don't worry about pesky rain spoiling your power supply—the spring-loaded cap keeps the receptor dry and free of road muck. Electronic Cruise Control: If you're ready to take Touring to the next level, the cruise control feature will help you settle in for the long haul. Get the comfort of the cruise without the cables cluttering up your handlebar. Our electronic throttle control technology makes it possible to have the best of both worlds. H-D® Smart Security System with Siren and Automatic Bike Lock: The factory installed next-generation security system with siren features a hands-free fob that automatically arms and disarms the vehicle electronic security functions as you approach and walk away from the bike. Stick the fob on your ignition key ring and let it do all the work. 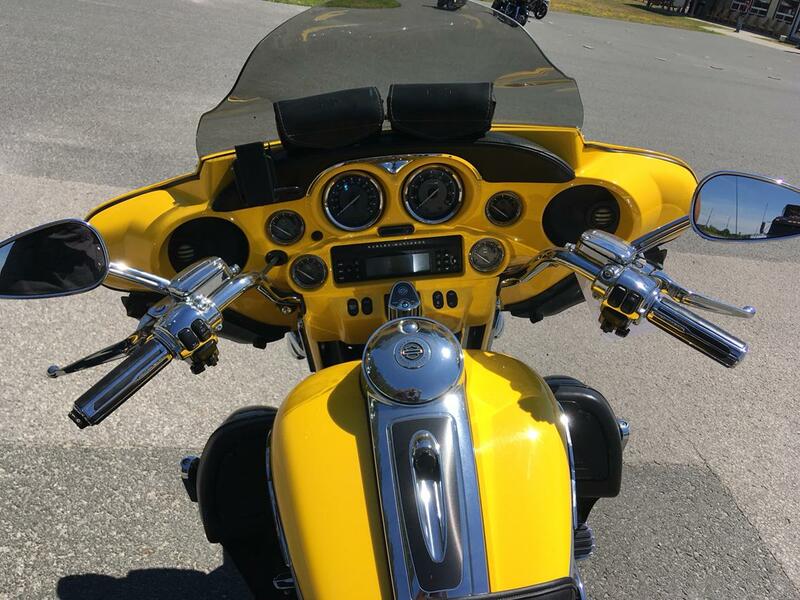 For additional peace of mind, the automatic bike lock features a key fob that locks the ignition, Tour-Pak and saddlebags so you won't have to worry about leaving your valuables tucked away on your ride. It's this attention to detail and rider security that make Harley-Davidson® motorcycles unique. iPod® Port (iPod® Included): Just having the juice to let loose isn't enough to call this system custom. It's your tunes that tell the story of your life on two wheels. With an iPod® dock in the right-hand saddlebag, a module integrated into the radio, and the intuitive controls right at your fingertips, the music is now yours, and that story is yours to write. We'll even throw in an exclusively-designed 8GB iPod® nano. Harman Kardon® Audio with BOOM!™ Audio Features: Naturally, the king of the road gets some royal extras. When it comes to hearing your tunes or just keeping your own chatter free and easy, the premium Harman Kardon audio system has it all: 4 speakers (2 up front and 2 in back) with an amplifier that distributes 40 watts per channel, an AM/FM receiver, CD and MP3 player—even an intercom and CB. It's loud, it's proud and yeah, it might as well go to 11. Plus, new for 2012, we've improved the already awesome sound by upgrading to BOOM! Audio High-Performance BOOM! Bagger speakers with customized equalization for BOOM! audio, and added BOOM! Audio Bass Booster Tour-Pak Ports to give these blasters the room to move booming deep bass. Sure, that's a lot of boom, but we figure you can handle it. Touring Chassis: A true Touring bike has to be tough enough to take on thousands of miles for years to come. Our Touring chassis is designed to do just that. Based on a single-spar, rigid backbone frame and swingarm, it easily handles the hum of that big Screamin' Eagle® engine, and it's built to last. Perfect for riders that always take the scenic route. Air-Adjustable Suspension: With air-adjustable suspension that comes standard, you can dial in your ride to accommodate heavier or lighter payloads, unexpected road conditions or simply set it to how you like to roll. The lighter the load, the softer you can go by decreasing the air pressure a bit, or increase the air pressure for a more rigid ride. It's all about rider and passenger comfort and setting your bike to fit your taste—the easy way. 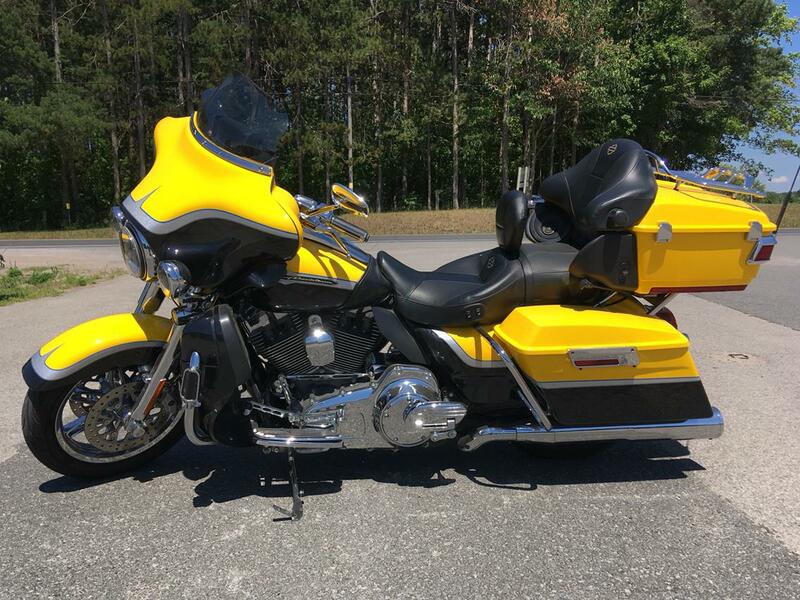 Suspended Dual Control Heated Seat with Passenger & Rider Backrest: Need help convincing someone to let you buy your CVO dream bike? Or just to come touring with you? This custom all-leather seat's for them. Its suspended, dual control design offers the ultimate in touring luxury for rider and passenger, mile after mile. It sits low and it's trimmed in at the thighs for ultra-comfortable long-hauling. Its suspension feature acts as a secondary shock absorber. 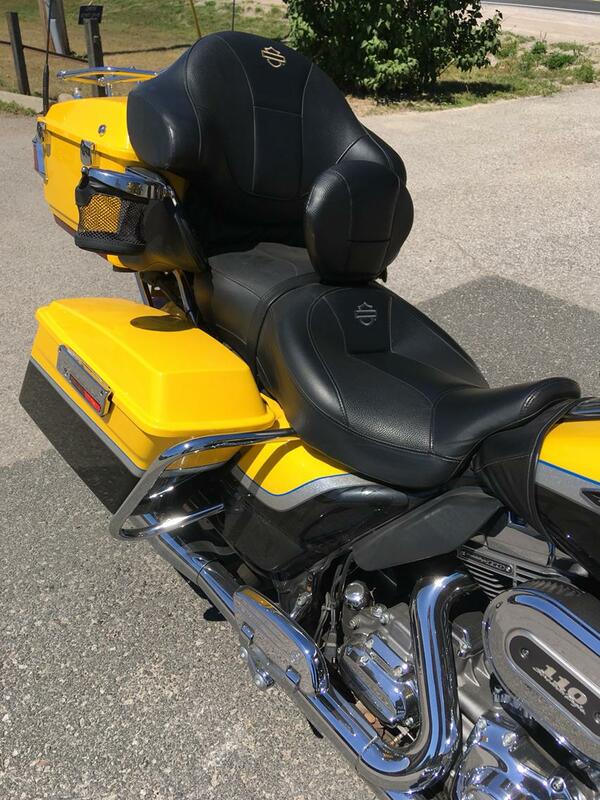 The embroidered H-D Bar & Shield passenger backrest is plush and cozy, with adjustable lumbar support. With all that plus in-seat heating, even the most finicky hangers-on will be happy to keep on going. Heated Hand Grips: When the chill gets at you, just having a little heat would be nice enough. But this is a Harley-Davidson® Custom Vehicle Operations™ motorcycle and we're all about the details. Our heated handgrips have six settings, so you can easily adjust on the fly for the heat you need with the versatility and control you come to depend on. 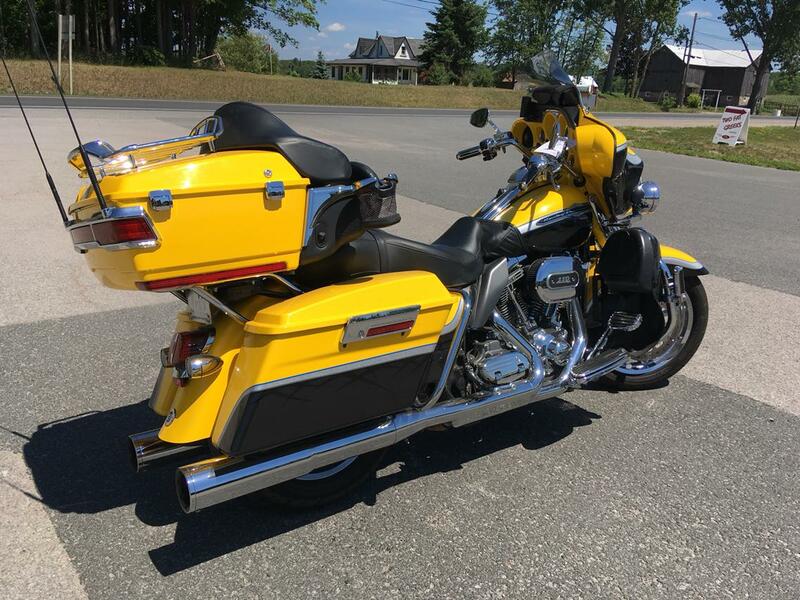 Vented Fairing Lowers: Don't be a prisoner to the elements outside—take control of your ride with the color-matched fairing lowers on the CVO™ Ultra Classic® Electra Glide® model. Slide them open for a cooler ride or leave them fixed to fight the wind tooth and nail. Use the glove boxes to empty your pockets, ditch your phone, and ride free. When it comes to Touring, Harley-Davidson® Custom Vehicle Operations™ is all about optimal comfort every time you hunt down a horizon. Full-Length Footboards: Your boots were made for riding, in any way you see fit. Our full-length rider footboards boast a tried and true design that's stood the test of time. Rubber vibration isolation offers a comfortable ride every time. And heel and toe shifting makes getting through the gears quick and easy. Plus, height adjustable passenger boards add another level of comfort for your riding partner. Vehicle shown may vary visually by market and may differ from vehicles manufactured and delivered. See your dealer for details. Vehicles depicted may differ from vehicles manufactured and delivered. Specifications and prices listed may differ from specifications and prices of vehicles manufactured and delivered. All product descriptions (including depictions, specifications, dimensions, measurements, ratings and competitive comparisons) are based on available information at the time of publication. Although such descriptions are believed correct, errors and changes can occur and complete accuracy cannot be guaranteed. Harley-Davidson may make changes at any time to prices and specifications, and may change or discontinue models, without notice and without incurring any obligation. Attention: Vehicles in the configurations shown and many of the accessories described in this catalog may not be available for sale or use in some locations. Please check with your dealer for complete product details and the latest information. All models feature 6-speed transmission (VRSC™ models and Sportster® models are 5-speed) and carbon fiber belt final drive; multi-plate clutch with diaphragm spring in oil bath; and 2-year unlimited mileage warranty.